Immerse yourself in Regency romance and be swept away by love! 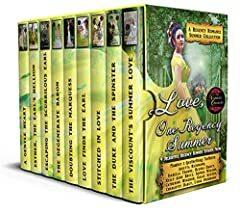 This collection of nine full novellas presents some very different heroes and heroines, but the common theme is that they all find love, despite trials and tribulations along the way, in some way related to Summer, in the area surrounding the town of Upper Nettlefold. The stories in this collection, because they all happen in Upper Nettlefold, have things which happen, that influence the other stories. So the order in which they are presented here aligns with the timeline in which events in the stories happen. Read through this collection in order, and you will find that each story builds on the ones before, weaving the magic of community and interconnection between characters. There is also a map of Upper Nettlefold to help you visualise everything as you read. Although each story can stand alone, weâ€™re sure that youâ€™ll love finding the linkages as you go. This is our first visit to Upper Nettlefold, but it wonâ€™t be our last. You may see other collections based here, or you may see individual books from the various authors, but we will keep expanding the stories about the people youâ€™ll first meet in this collection. A new Viscount with old secrets, a bakerâ€™s daughter, love thwarted, the threat of murder, a dramatic revelation, a long-held love finally returned. A seamstress who struggles to sew, a blacksmith beset by admirers, an accident with a dress, a runaway horse, a situation saved â€“ barely, an unexpected love. An unmarried Earl, a reserved widow, a clever sister, a social occasion, an accidental meeting, shady business dealings thwarted, a second chance for love. An unrepentant rake, a woman more interested in business than men, a meeting, jealousy, an accident, a revelation that leads to love. A fearless schoolteacher, a Baron lost in grief and despair, a collection of degenerate friends, a near accident that leads to a meeting, a reminder of past pain, a love beyond fear. A merchantâ€™s daughter, a lonely physician, a thoroughly unscrupulous Earl, a debt called in, an impossible choice, an escape, a threat, a rescue, and a new love found. An orphaned young woman, a gentleman working undercover, a boarding school with a new owner, a despicable scheme, a rescue, a trap set to save, a dramatic conclusion, a fated love found. A spinster employed as a companion, a gentleman of means, a social opportunity, an act of kindness, a misunderstanding, a long hoped for love.